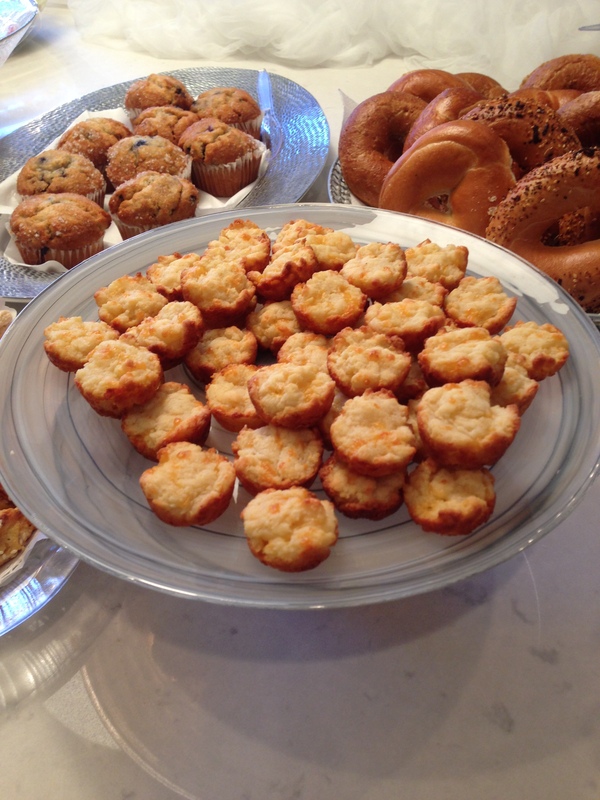 Posted on October 21, 2013 by Michele D.
This month’s “Chopped Challenge Kosher” Linkup was anything but boring. The challenge: make a food item that includes corn, pears and Mike and Ike candy. I love corn and I love pears; not so much with the Mike and Ike but my 7 year old daughter is a big fan so she happily helped me with the prep and baking last night. Preheat oven to 400 degrees F (200 degrees C). Grease or line 12 muffin cups. In a large bowl, cream together butter, sugar, honey, eggs and salt. Mix in flour, cornmeal and baking powder; blend thoroughly. Stir in milk and corn. Mix in the chopped up Mike and Ike candy. Add a bit more milk if needed. My batter was thick but not so much so that I couldn’t spoon it into the muffin cups. Pour or spoon batter into prepared muffin cups. 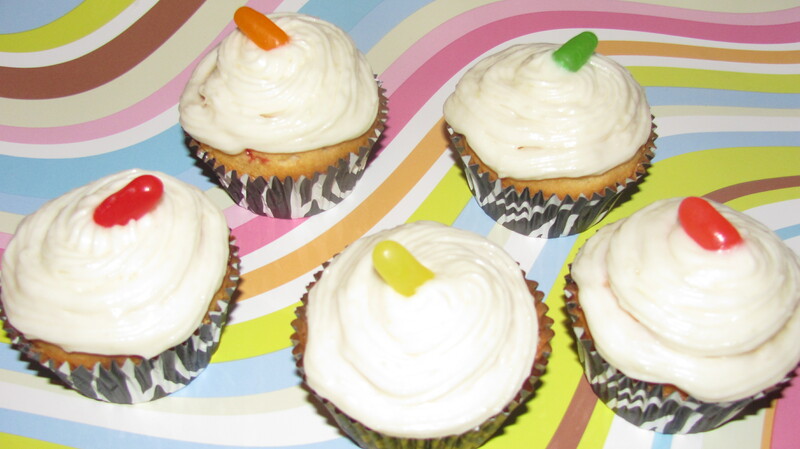 Cream Cheese – I ended up adding some cream cheese to make the frosting thicker so have some on-hand just in case. In a medium-sized mixing bowl, mix butter on high speed with an electric mixer for two minutes. Add mascarpone and mix until just combined. Add powdered sugar a little bit at a time until just combined. Peel and slice the pear. Puree the pear slices in a food processor. Mix two tablespoons of pear puree into the frosting. I must not have drained enough of the liquid from the pear because my frosting was way too thin. I ended up adding more powdered sugar and some cream cheese to make it thicker. 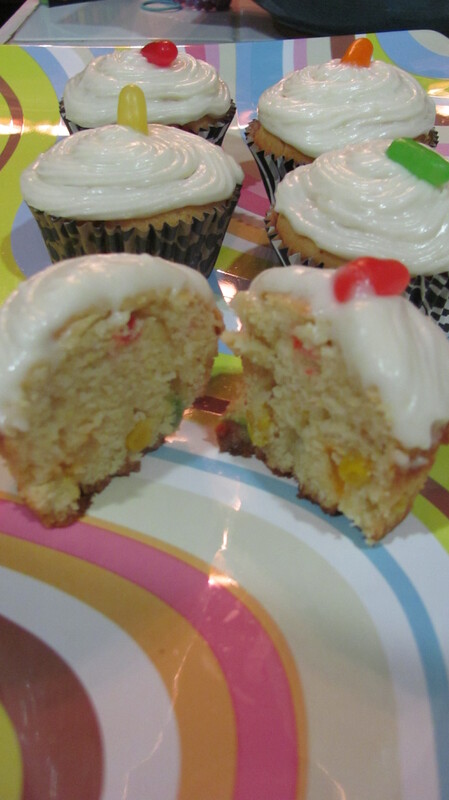 Then I used a frosting bag and star tip to pipe the frosting onto the muffins. I topped each with one piece of Mike and Ike candy. Both my daughter and hubbie were a fan of this weird little dessert/bread treat. It combines salty and sweet flavor in a nice way and the Mike and Ike candy and the corn give it a fun and unexpected crunch. Plus the frosting is creamy and delicious with just a hint of pear. It was a fun experiment and will be a nice surprise in my daughter’s lunch box today! This month we tried something new and different, a Chopped Style Challenge. 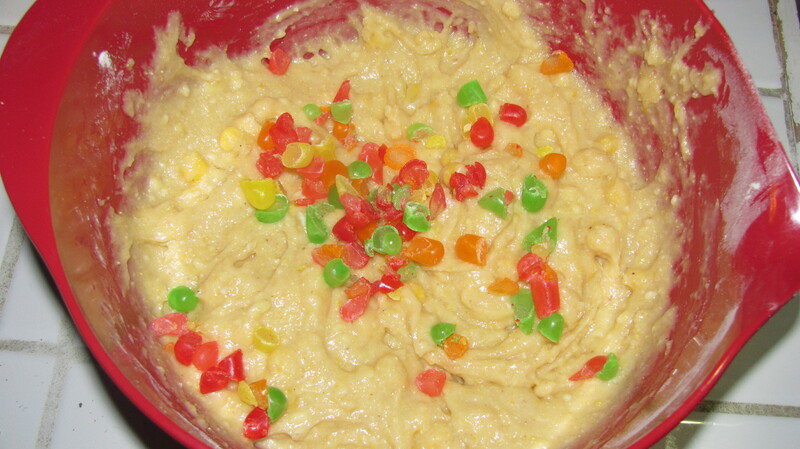 Each participant had to use at least two of the following items: canned corn, pears and Mike and Ike candies ! 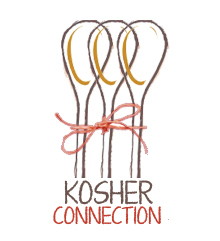 Follow our recipes on Twitter with #KosherRecipes. Since this month is a chopped style challenge, go ahead and vote for your favorite. Let’s see who is the winner of our Chopped Challenge!! Posted on October 11, 2013 by Michele D.
In September of 2011, I attended a bingo night in my neighborhood. I know the month and year because after bingo, I BEGGED the hostess Judy to give me the recipe for her amazing Mini Cheese Biscuits. Thankfully she did via an email sent the next day. I still have my printout of the email … with the date and year on it. These biscuits are so delish that I’ve kept that cherished email printout all this time. The biscuits are cute, small, easy to make and very addictive. So without further ado, here is the recipe for what my neighbor calls “Mona’s Incredible Cheese Biscuits.” I don’t know who Mona is but thank you very much! Preheat the oven to 425 degrees. Mix all ingredients together and spoon into mini-muffin pans a tablespoon at a time. I purchased a great mini-muffin pan that holds 18 muffins at Target and filled each slot about 1/2 full. Bake for 10 minutes or until the biscuits are golden brown. Remove from the oven and cool for 5 minutes on wire racks. These can be prepared ahead and frozen for up to a month. Thaw frozen biscuits on the counter and reheat wrapped in foil for 10 minutes or until warmed through, if desired. They are also delicious at room temperature. Enjoy, Shabbat Shalom and Happy Kosher Treif Cooking! Posted on October 8, 2013 by Michele D.
When I was growing up, one of my favorite events was the Potluck lunch. 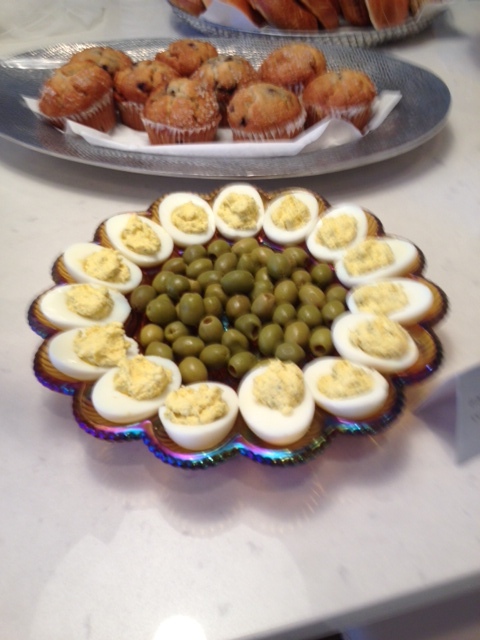 There were one or two cute, little old ladies in our community who made the most yummy deviled eggs for the lunches. And if you weren’t one of the first people in line, you missed out on these delicious treats. Since then, I’ve thought about those deviled eggs many times but never seriously considered making them myself because they seem high maintenance. But during my last trip to my Mother’s house, I discovered a beautiful deviled egg platter hiding among the many beautiful dishes in her cabinets. I snagged the dish and have been looking for the perfect opportunity to debut it since. Place the eggs in a saucepan just large enough to hold them all in one layer (I made 18 eggs). Add water to cover by 1 1/2 inches. Add 1 tablespoon salt. Bring to a full rolling boil. Cover, remove from heat and let stand, covered, for 20 minutes. Pour off hot water and fill plan with cold water and a handful of ice for 15 minutes or until cool. Pour off the water. Peel eggs under cold running water. Purée yolks with 2 1/2 ounces fresh mild goat cheese, 3 tablespoons milk, ¾ teaspoon Dijon mustard. Season with salt and pepper and pulse in 2 ½ tablespoons chopped dill. Fill whites. And if you want to semi-Treif it up, throw in a few Baco Bacon Flavor bits! The goat cheese adds such a unique twist to the traditional deviled egg and was such a surprise to the guests at the shower. I only had 4 deviled eggs left and I happily ate them myself.